Funky Thermaltake Gaming Mouse Sports a Fan! 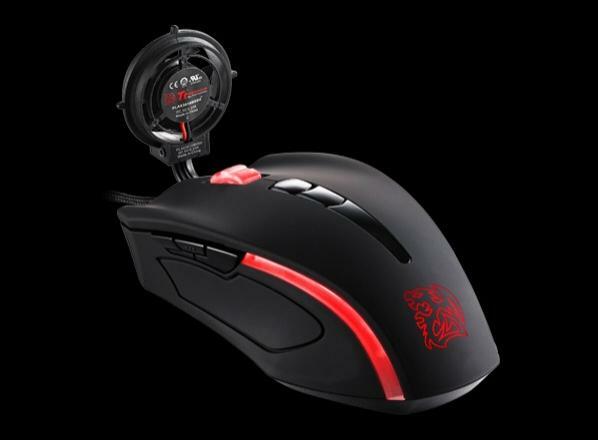 JM Balicano July 31, 2012 Accessories and Peripherals 2 Comments on Funky Thermaltake Gaming Mouse Sports a Fan! I like to play a lot of PC games so various gaming peripherals do interest me. However since starting MobileTechPinoy, I haven’t exactly seen anything new or groundbreaking that was worthy enough of writing about. 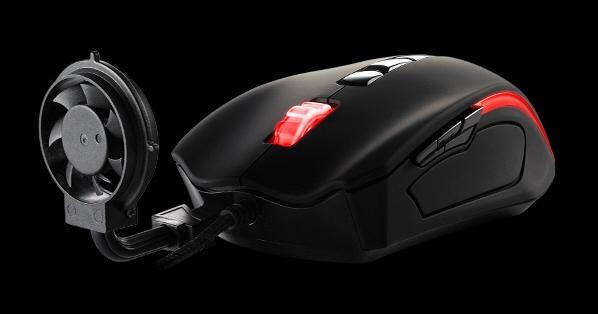 Most of them seemed like rehashes of previous designs, that is, until I saw the Black Element Cyclone Edition gaming mouse by Thermaltake. It’s rated at 6,500 dpi and its weight can be adjusted by up to 22.5 grams to achieve the best feel possible in your hand. The grip coating is even military-grade if you care to know, but surely other peripheral companies have come out with something like this in the past with their gaming mice. Well, there is one thing that sets this particular gaming mouse apart from the competition. Because of our palm’s natural tendency to sweat over time, extended gaming sessions can become icky and uncomfortable as it accumulates. The Black Element Cyclone Edition remedies this via a fan attachment that is rated at 6,000 rpm. That’s strong enough to deliver 2.6 cubic feet of air per minute right at your fingers and palm to keep them dry. I have to say that the fan attachment would make a gamer look kind of dorky. Thankfully, the fan attachment can indeed be removed if you’re gaming in public, but if you plan on gaming at home, I’d advise keeping it on so you don’t have to wipe your palms on your shirt every so often. You’ll have to wait though, as it’s still scheduled for an August release in the US and nothing yet on a Philippine release. Check out the gallery below for more pics or the source links at the bottom for more info. And a fan – how good is that! lol. some peripherals are purely for comfort. no way I’d willingly look like a dork with this in public.